The tie-up between Google and Nestlé through the new Android KitKat smartphone operating system is prompting a reaction in the media and amongst campaigners. 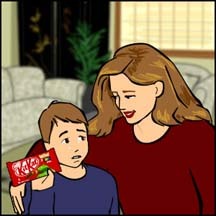 This reminder of Nestlé malpractice comes in the lead up to International Nestlé-Free Week, taking place from 28 October – 3 November 2013 (in some countries this covers Halloween). A cartoon by Nitrozac and Snaggy is receiving a lot of attention. Click here or on the thumbnail left to view the full cartoon. Google’s own first-page of search results on Android KitKat includes a BBC report citing concerns over Nestlé baby milk marketing and pet food recalls. A Greenpeace campaign video on the destructive nature of palm oil sourcing for KitKat has gained a new lease of life with supporters calling for a boycott of Android KitKat. Nestlé promised to changes it practices by 2015 (typical of its strategy of diverting criticism by promising future action – in 2000 it promised to stop child slavery and labour in its cocoa supply chain within five years, but has not done so). Other campaigners have set up a group on Facebook called Love Android – Hate Nestlé. This has no connection with Baby Milk Action and shows how public awareness of Nestlé malpractice keeps up the pressure on the company. No doubt Nestlé’s Digital Accelaration Team is keeping careful track of all postings about Android KitKat and making postings to try to counter the bad publicity from its hi-tech centre in Switzerland – see this Reuters report. In the past it has been reported that Nestlé pays celebrities US$10,000 to post tweets in support of the company – click here.